A contract agreement is a document between two or more parties that outlines the responsibilities of each party and states what value or payment they will exchange for the performance of those obligations. Although a valid contract sometimes can be made verbally, the safest practice is to get terms in writing. The basic elements of a contract are an offer, an acceptance and an exchange of something of value. To be valid, a contract must outline each of these elements and show that the parties reached an agreement. By understanding the basic requirements of a contract and paying attention to writing terms clearly, you can write simple contracts yourself. Name the parties, stating the name and address of each person or business. Phone, email and fax numbers should also be include, especially if you have never met the other party. If either party is a business, list the state of incorporation. Spell out each party’s responsibilities by providing a list all of the products or services to be provided and delivery dates. This can be as simple as a bullet list of what each party is responsible for doing. Don’t try to sound like a lawyer. Simple language that is easy to understand will work fine. Your purpose is to avoid disputes about what is supposed to happen,and to ensure that you outline each party’s expectations. Describe the consideration or value to be exchanged. If you are being paid, then state whether the payments will be a lump sum or made in installments. State the amount to be paid and when it is due. If you are a buyer and want the right to withhold payment if you’re not happy, then say so in the contract. Address such other Issues as how or whether either party can get out of the contract, what happens if one party does not perform its obligations and how the parties will resolve disputes. Create a block with a line at the end of the document in which you will print the name and title of each person signing the contract. Ensure that those who sign have the authority to do so. Add a line for each signature and the date of each signature. The contract will not be enforceable unless it is signed by both parties. Read everything carefully before signing. If there is any question about what something means, rewrite it until you are both satisfied. Carolyn Winters has been a legal professional since 1994, specializing in general business, legal and contract issues. Winters has a B.S. in computer science and an M.B.A., both from Loyola College in Maryland. She received her J.D. from the College of William and Mary. Winters, Carolyn. 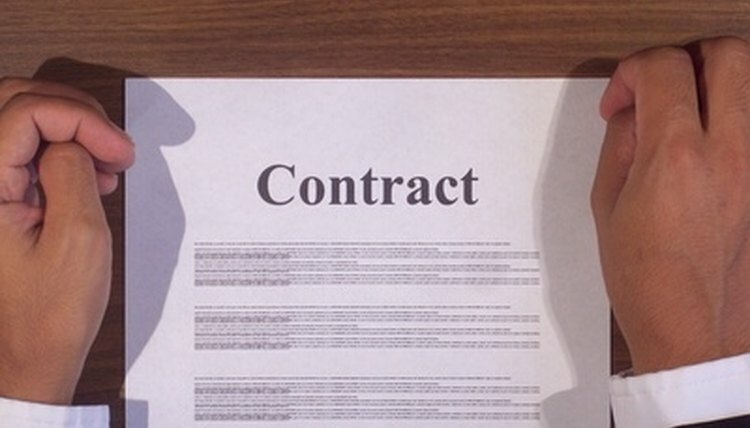 "How to Create a Contract Agreement." , https://legalbeagle.com/6234812-create-contract-agreement.html. Accessed 26 April 2019.